One of the most celebrated (and discussed) saints in the Orthodox pantheon, Mary of Egypt has a long history. Scholars attribute the earliest known version of her legend to Sophronios, Patriarch of Jerusalem (+ 639 A.D.). Written first in Greek, it appeared later in Latin, French, Spanish, Dutch, Portuguese, Italian, German, Norwegian, English, Armenian, Ethiopian, Syrian and Ukrainian translations. Immensely popular throughout the Middle Ages, both in the East and West, the haunting figure of Mary of Egypt is known also in modem literature. Dostoevsky mentions her in The Brothers Karamazov (1880), James Joyce in Ulysses (1922). The subject of a poem by the American poet John Berryman, she is named in its title, No 47: April Fool's Day or Saint Mary of Egypt (1964). Along with this "funny title," the poem's final two verses note that Mary's feast day falls on April 1.
whom God has not visited. The poet suggests that unlike Mary, whom God "visited," some of us wear a "fool's cap." In addition to April 1, this saint is also commemorated in the Orthodox Church on the Fifth Sunday and Thursday of Lent. As indicated by her name, Mary was born in Egypt. When she was twelve years old, she ran away from home. She went to Alexandria, the cosmopolitan city founded and named for the world conqueror born in Macedonia. There the runaway girl became a prostitute. For seventeen years Mary led a licentious life on the streets of that busy Mediterranean seaport. She enjoyed the life she had chosen. Money did not interest her. Mary had, she confessed, "an irresistible passion for wallowing in the mud." One year, she encountered some young men down by the harbour Wishing to venerate the Holy Cross in Jerusalem, the young men were about to sail to the Holy Land. Mary, always ready for adventure, joined them. She had no money. So she offered herself as payment for her passage. The young men accepted her offer. On arrival in Jerusalem, the pilgrims from Alexandria went to the great church to venerate the Cross. (It had been discovered in 326 AD by Saint Helen.) Out of curiosity, Mary joined the procession with her fellow-travellers. Unlike them, however, she could not step across the threshold into the church. She tried repeatedly, but each time invisible hands held her back. After Mary's companions entered the church, she remained alone, outside in the courtyard, frustrated and weeping. Suddenly the thought crossed her mind that it was her dissolute life which prevented her from entering the church. Mary then noticed an ikon of the Theotokos. Falling on her knees before it, she appealed to the Mother of God to help her enter the church. Always as compassionate as her son, the Theotokos granted Mary's request. After venerating the Holy Cross, Mary returned to the ikon to thank the Theotokos for the mercy and grace given her. As she stood in front of the ikon, Mary heard a mysterious voice, instructing her to cross the Jordan. She obeyed the voice. En route to the river, she met a Christian who gave her three loaves of bread. By nightfall Mary reached the Church of Saint John the Baptist, located near the Jordan. When she had washed her face in the sacred water, she returned to the church and received Holy Communion. She then ate half of one of the three loaves of bread and drank water from the Jordan. The next morning, Mary found a boat and crossed over into the desert on the other side. She was at that time twenty one years old. She spent the rest of her life in the wilderness. For forty-seven years Mary lived in total isolation from the world. Until the day a monk named Zosimas found her, she had neither seen nor talked with any human being. Zosimas was a holy man much honoured for "the purity of his way of life and the fervour of his repentance." For fifty three years, since childhood, he had submitted himself to a strict ascetic discipline. Although he had attained spiritual perfection, Zosimas had the uneasy thought that somewhere there was someone who surpassed him spiritually. He decided he must somehow find that person. Zosimas therefore entered the Monastery of Saint John the Baptist, near the Jordan, "the holiest of rivers." This monastery was famous throughout Christian East for its austere rules and the extraordinary holiness of its community. Every year, on the first Sunday of Lent, the monks of Saint John's crossed the Jordan and withdrew into the desert. Each monk went his separate way, to pray and fast alone until Palm Sunday. Zosimas also made this Lenten retreat. After walking twenty days into the interior of the desert, he saw a human figure in the distance. Fearing it might be a demon, he made the sign of the cross. He then began to pursue the strange, black-skinned, white-haired creature, begging it to stop. Mary stopped. Calling Zosimas by name, she asked him for a cloak to cover her naked, sun-baked body. That the stranger knew his name astonished the monk. At the same time, it revealed to him that she was a "vessel" of the Holy Spirit. Mary and Zosimas prostrated themselves at the same moment. Each thus acknowledged the holiness of the other. Mary, respecting Zosimas because he was a priest, asked for his blessing. For his part, Zosimas, certain that Mary was a saint, asked her to bless him. "Your grace," he declared, "is greater than mine." Zosimas had expected to find his spiritual superior among the monks in the monastery by the Jordan. Instead, he discovered a woman in the desert whose spiritual triumphs outshone his. This was Mary's first contact with a human being in the forty- seven years since, led by the Theotokos, she had crossed the Jordan into the barren desert. She wanted to know about Zosimas. She also questioned him about conditions in the world. Was there peace? Did the church prosper? How were the Christians? Zosimas answered her questions. Reverently addressing Mary as "my spiritual mother," he begged for her intercessions in heaven. While the monk continued to lie prostrate on the ground, Mary stood in silent prayer, her arms stretched toward heaven. When Zosimas lifted his eyes, to his amazement he saw Mary standing in the air, several feet above the ground. The thought again crossed his mind that she must be a demon. Demons, it was well known, inhabited the desert wastelands. But Mary, reading his unspoken thought, reassured him. "Do not doubt," she said, "that I am only a woman and a sinner." Impressed by Mary's insight and powers of discernment, Zosimas wanted more than ever to hear her story. Mary described to him her career as a prostitute for seventeen years on the streets of Alexandria, her conversion in Jerusalem and the experiences of forty-seven years in the desert. Zosimas wondered how she had managed to survive alone in such a hostile environment. She explained. "For seventeen years I lived on the two and half loaves of bread I had brought with me. Although they became hard as rocks, I ate them, little by little. After that, I lived on plants growing in the desert." The first seventeen years had been the hardest. "This was a time of daily struggles against temptations of all kinds. Songs of the devil, which I used to sing, echoed through my head. When I was thirsty and had no water to drink, I remembered the refreshing sweet wines of Egypt. Then I would turn my thoughts to the Theotokos. And a bright light would shine in front of me, chasing away all bad thoughts. It was always the Theotokos who restored peace to my soul." In the course of their conversation, Mary quoted from the Scriptures, the "books of Moses, Job and Psalms." This surprised Zosimas. When he questioned her, she replied: "I never learned to read or write. For forty-seven years I have seen no one, not even an animal. I have had no teacher. God taught me these words." An illiterate woman, Mary had been transfigured into a "theologian of the divine Word." Convinced that he was in the presence of a person "who was pleasing to God," Zosimas tried again to kneel before her. But Mary, taking his hand, again did not let him. Before they parted, she told him to keep her story a secret. Mary also asked Zosimas to return next year on Holy Thursday and to bring her Holy Communion. He should not however, cross the Jordan: they would meet on the other side. Night fell. A full moon rose and shone in the sky. Mary still had not appeared. Zosimas sat and waited. No boat was in sight on either bank. He wondered how Mary would cross the river. "Now, Lord, let your servant depart in peace, according to your word. For my eyes have seen my Saviour." Zosimas offered Mary the dates, figs and soaked lentils that he had brought. But she refused everything, taking nothing except three tiny grains of the soaked lentils. Before parting from Zosimas, Mary asked him to return on Holy Thursday next year to their first meeting place in the desert. Mary then left him. She walked across the Jordan again and vanished from his sight into the desert. Zosimas had in vain tried to detain her longer. The monk then returned to his monastery, "joyful and amazed." Nevertheless, he regretted one thing. Zosimas did not know her name. He was sorry that he had not asked the woman for it. At their next encounter he would ask. The next year, on Holy Thursday, Zosimas crossed the Jordan and went to the place in the desert where he had first met Mary two years earlier. He found her dead. Her head faced the east. Her hands were crossed. On the ground beside her body were written these words: "Father Zosimas, bury the body of wretched Mary. Return to the earth that which is made of earth. Add dust to dust." Mary our Holy Mother had died the year before, after Zosimas had given her Holy Communion. Now as he chanted appropriate hymns and prayers, Zosimas wept. Then with a small stick he began to dig a grave for Mary. But he made little progress. The ground was hard and he was a feeble old man. Suddenly a large strong lion appeared and began digging the hard ground. His appearance startled Zosimas because Mary had told him that she had seen no animals in the desert. Soon the lion excavated a grave large enough for the saint. Zosimas then buried Mary. She was still wearing the cloak he had given her at their first meeting. After the burial, the lion and monk parted. The lion bowed to Zosimas and disappeared into the desert. The monk returned to his monastery. 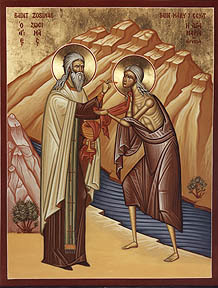 Before dying at the age of one hundred, Zosimas had told the story of Mary of Egypt. Later, patriarchs of Constantinople and emperors of Byzantium glorified Saint Mary of Egypt in sermons and hymns. "O holy transformation that brought you to a noble way of life. O godlike love, O burning faith in God. We bless you, Mary, worthy of great praise. And forever we exalt you above all others." Byzantine hymnographers address Mary as "holy mother." They describe her as "god-bearing," "god-minded," and victorious over Satan who deceived a "gullible little woman" (Eve). At the hands of Saint Mary of Egypt, Satan had endured disgrace, "defeat and ridicule." Trusting in her powers of intercessions in heaven, and relying on her sympathetic understanding, generations of Orthodox have turned in prayer to Saint Mary of Egypt. "O Holy One, behold my sorrow and the groaning of my heart. See the narrowness of my life. Save me from my sin and have mercy on my soul, through your mediation before the Lord."